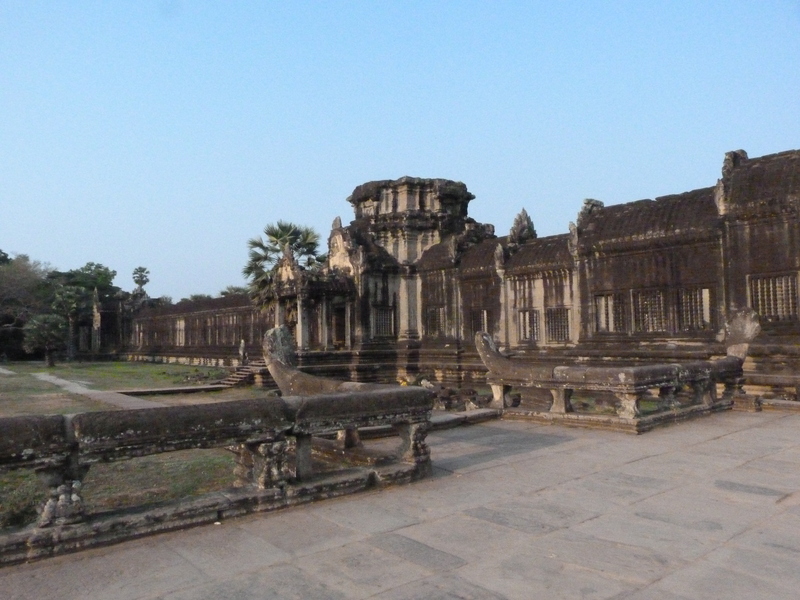 The obligatory Angkor Temples post! 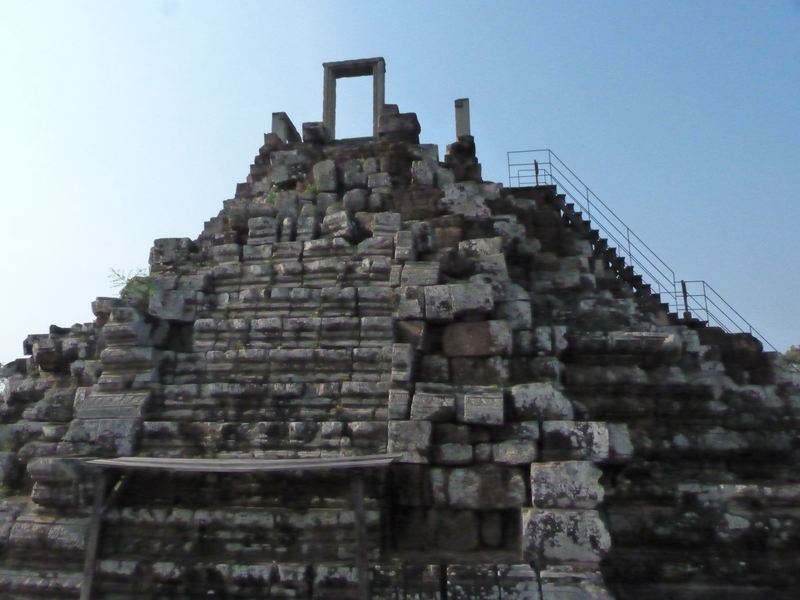 So…the obligatory post about the temples. Needless to say they are pretty amazing and this post will be pretty photo heavy! 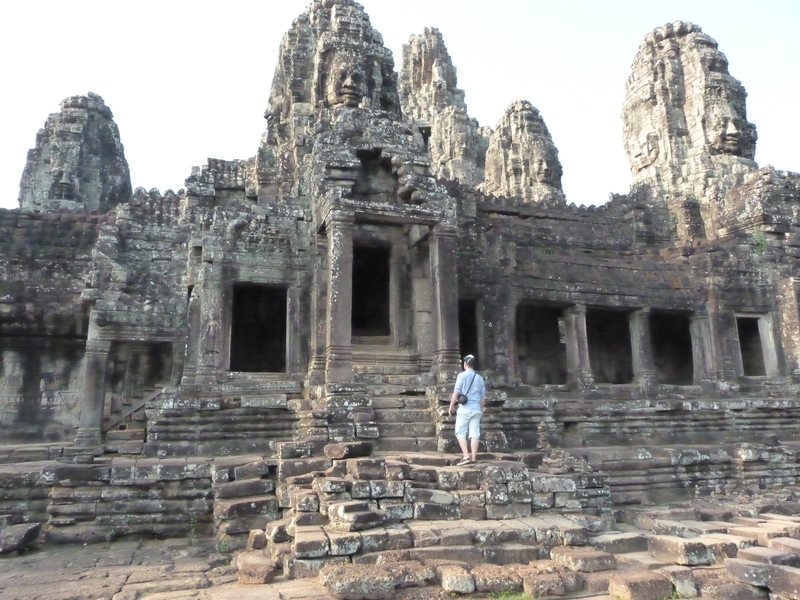 We arrived at our hotel in Siem Reap (The Angkor Secret Garden) thinking that we would just chill out ready for a day at the temples the following day. 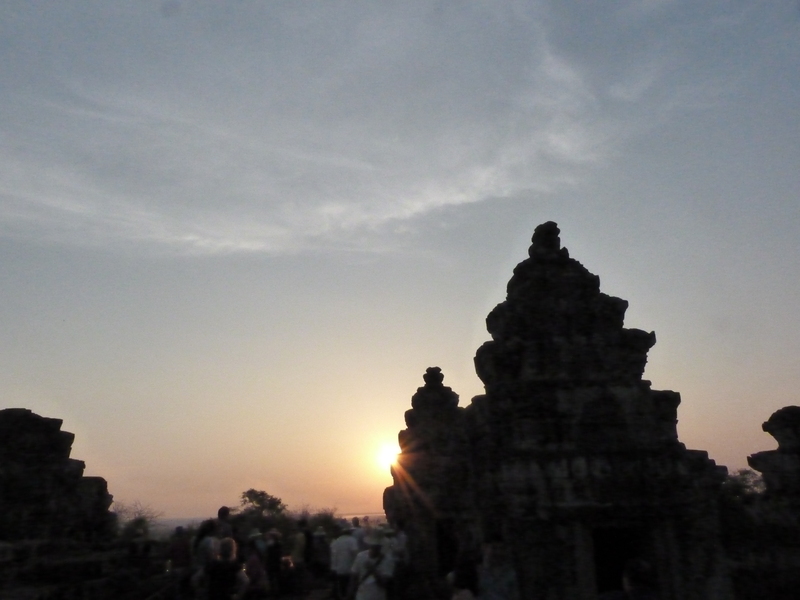 However, Mr Lucky, the hotel manager informed us that if we went to the temples after 5pm that evening we could watch the sunset over Phnom Bakheng and our ticket would be valid the next day. We decided this would be fun! 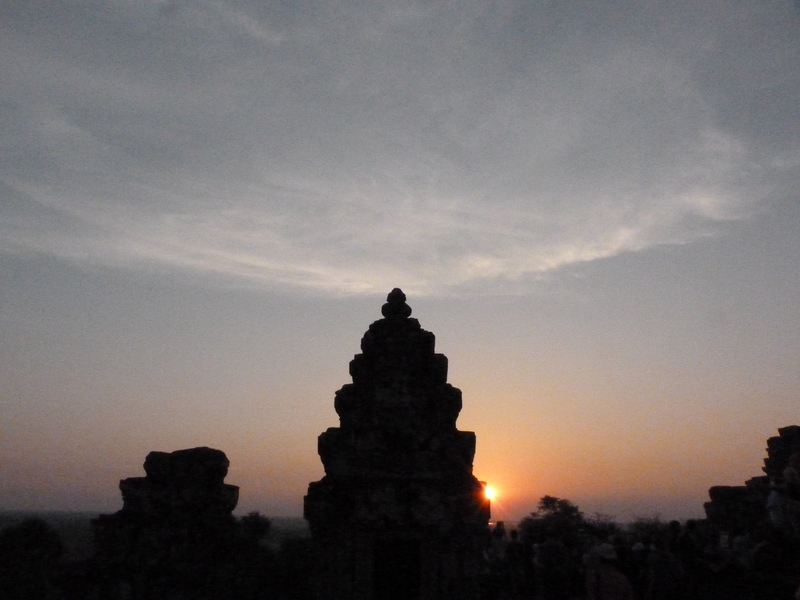 The tuk tuk driver who had picked us up from the airport returned and drove us around 8k to the site of the temples. 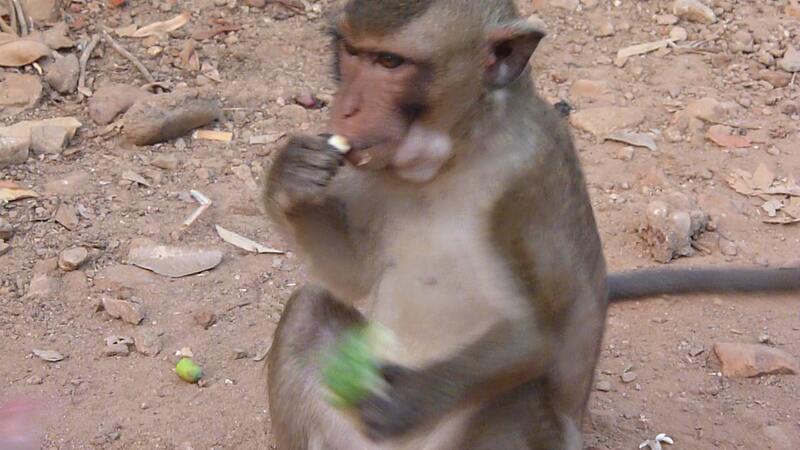 As we drove through the site we caught glimpses of temples in the distance and saw monkeys scurrying across the road. We pulled in and our driver explained we needed to walk up the hill to see the temple. You could hitch a ride on an el ephant for $20 each but we opted to use our own legs. The walk was shaded and not too long. At the top we climbed some seriously steep steps to reach the temple. We had to wait around an hour for the sun to set. It was quite crowded but there were a few places to sit. The stones were so hot that we actually burnt our bums! Once the sun started to set it was completely worth the wait. 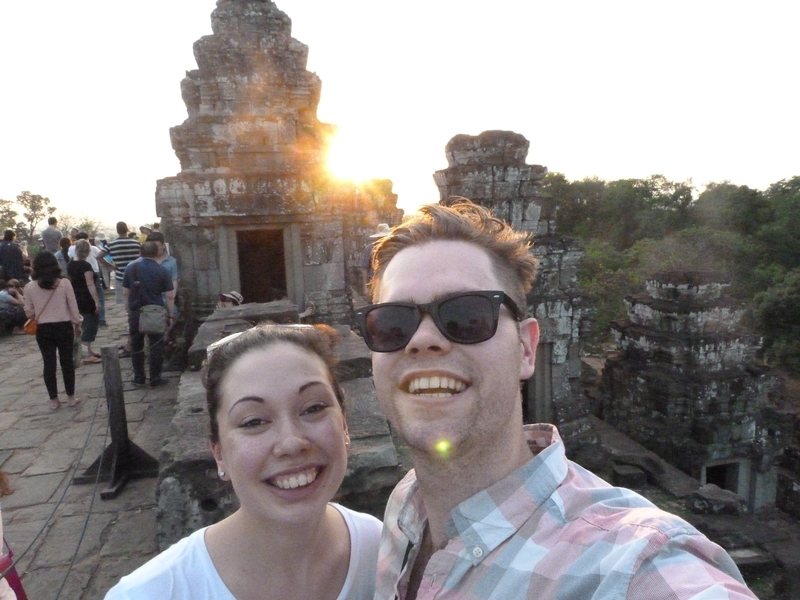 Our camera was misbehaving…or we are just rubbish at taking photos but we did get a few good shots. We found a little monkey on the way back down. I was possibly slightly more interested in the monkey than the sunset. 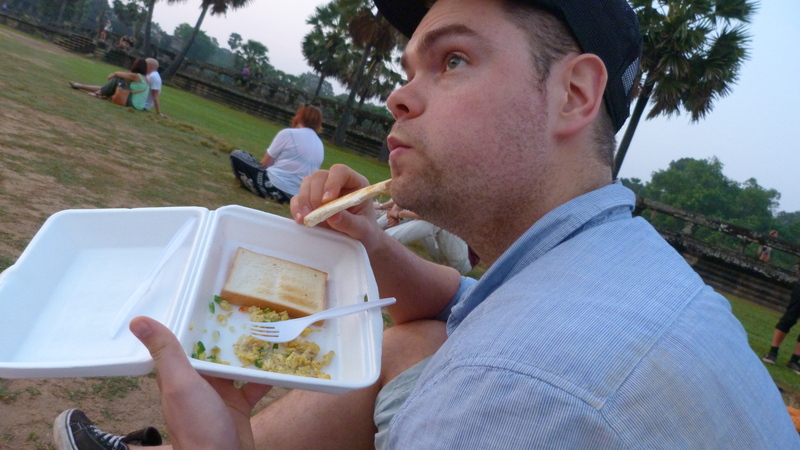 The next day we got up at 4.45am ready to meet our trusty tuk tuk driver at 5am. The hotel packed us up a breakfast. We ordered it the night before. I had a banana pancake and Dan had an omelet. They even gave us iced coffee and tea in plastic bags. This was a little tricky to carry on the bumpy tuk tuk ride. Even thought it was 5am lots of people were already up preparing food and setting up stands in the street. 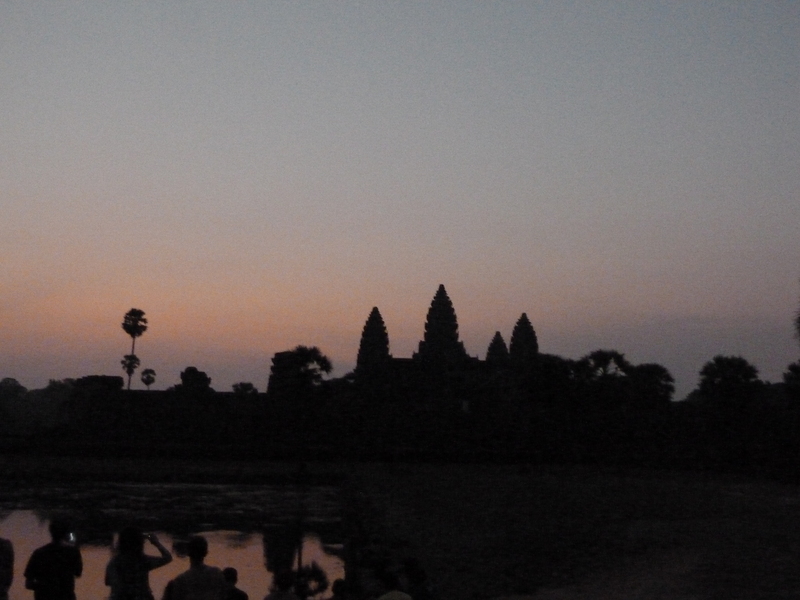 We arrived near Angkor Wat and made our way to the temple in the dark. It got light really quickly but there was a bit of a wait for the sun to rise. 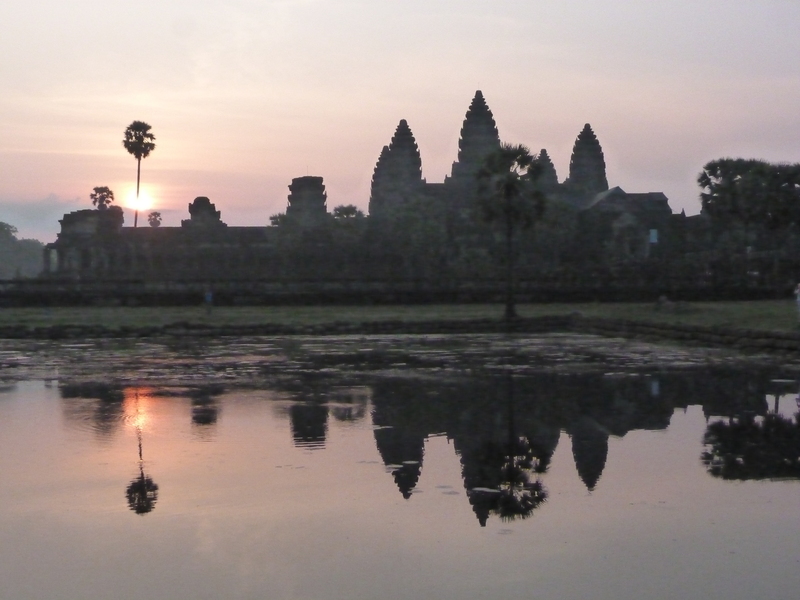 There were masses of people selling things such as scarfs, baggy trousers (the uniform of Siem Reap), guide books, postcards and drinks. We chatted to a lady called Anna who had a cold drinks stand. She was amazing and told us exactly where to stand to get the best view. She actually followed us and insisted on making sure we had the perfect spot! 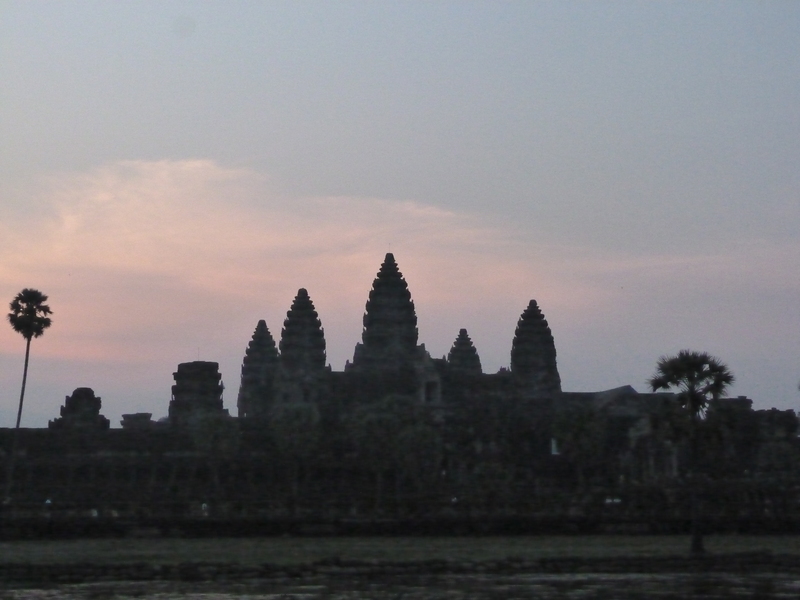 After the sun had risen we wandered around Angkor Wat. I think this is my favourite temple. 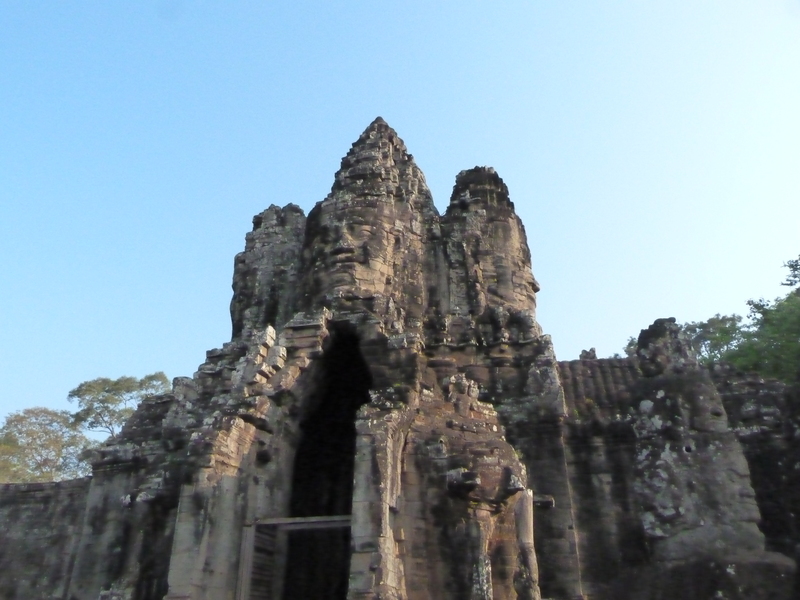 Our tuk tuk driver waited patiently for us all this time and when we had finished at Angkor Wat we found him and he drove us to the Angkor Thom complex. 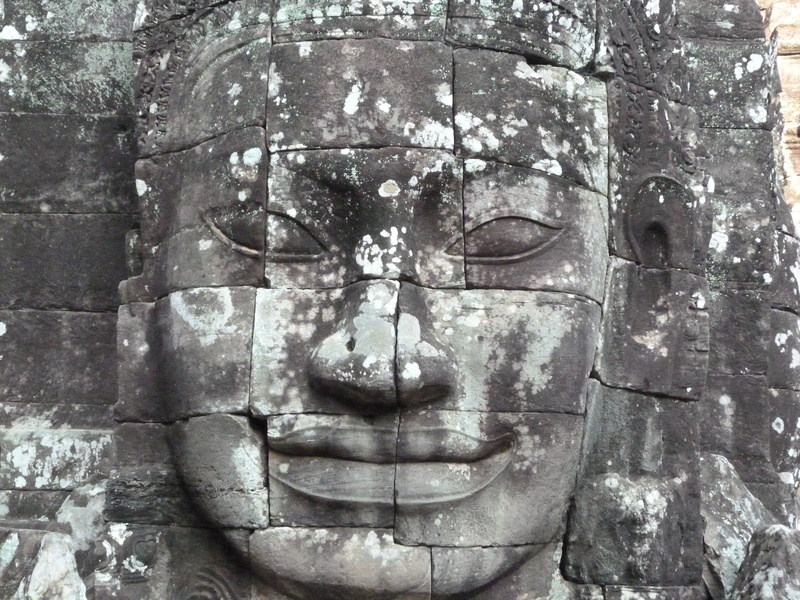 Angkor Thom means Great City and consists a many different temples with two big entraceway gates. 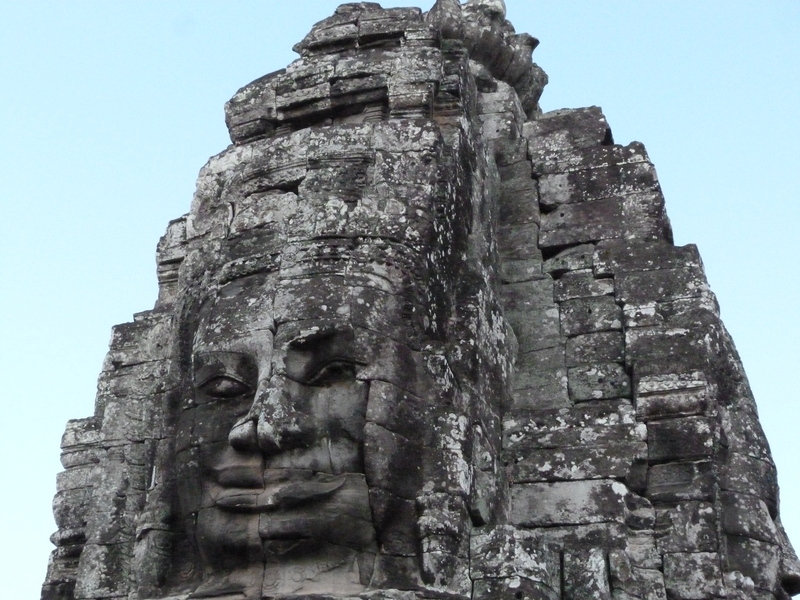 I absolutely loved Bayon. 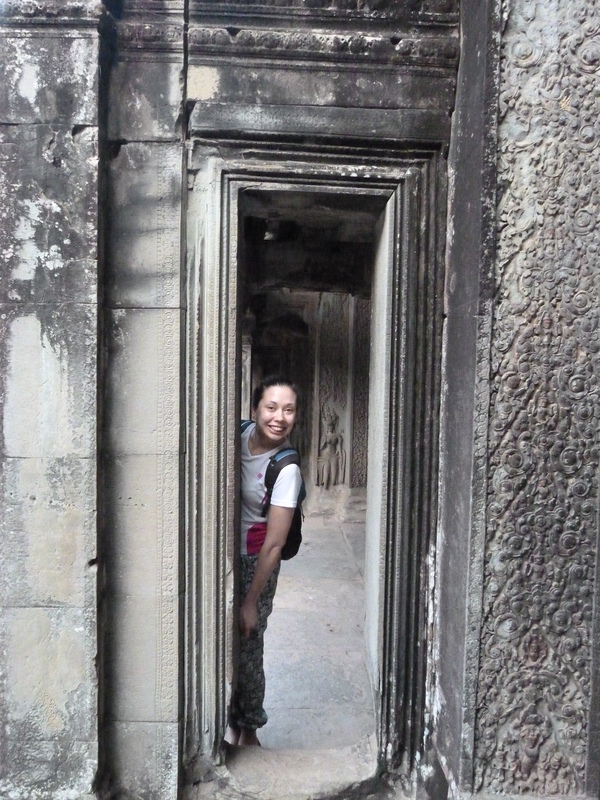 This temple had many faces of Budha carved into the stone. 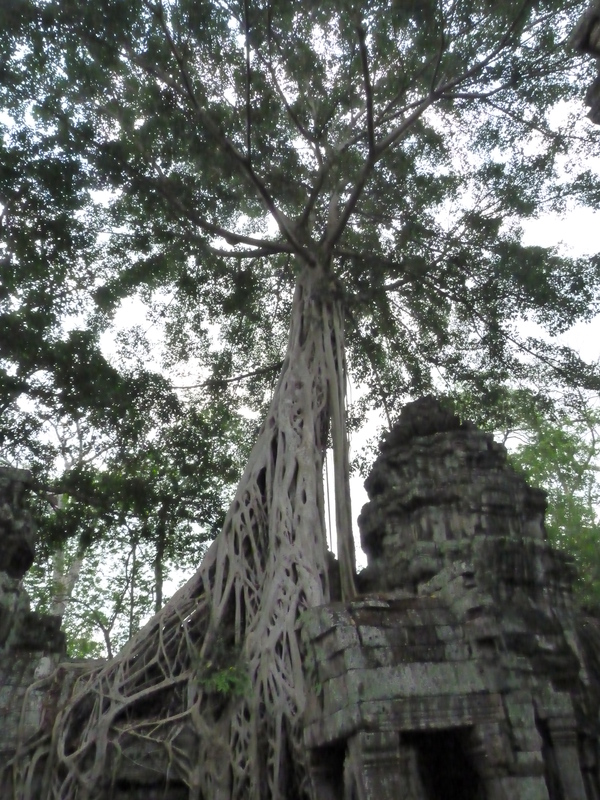 The final temple we saw was Ta Prohm. 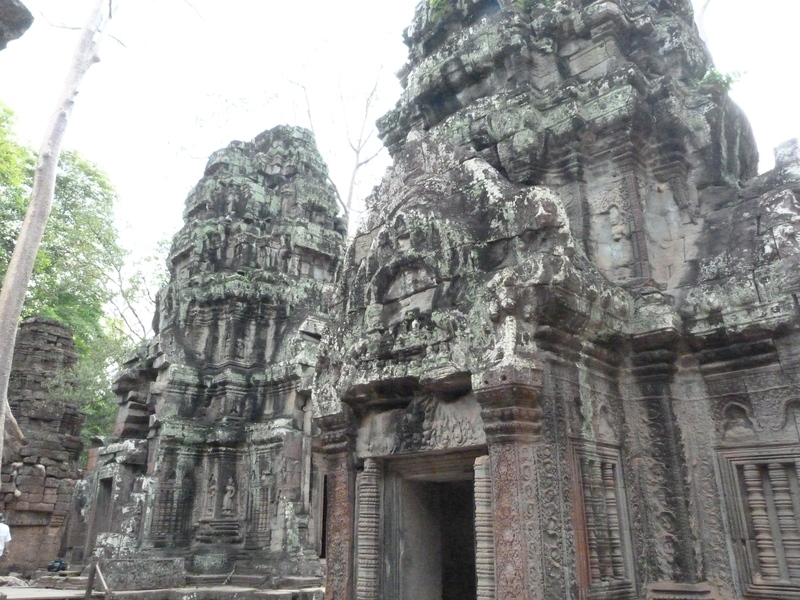 This is temple where tomb raider was filmed. 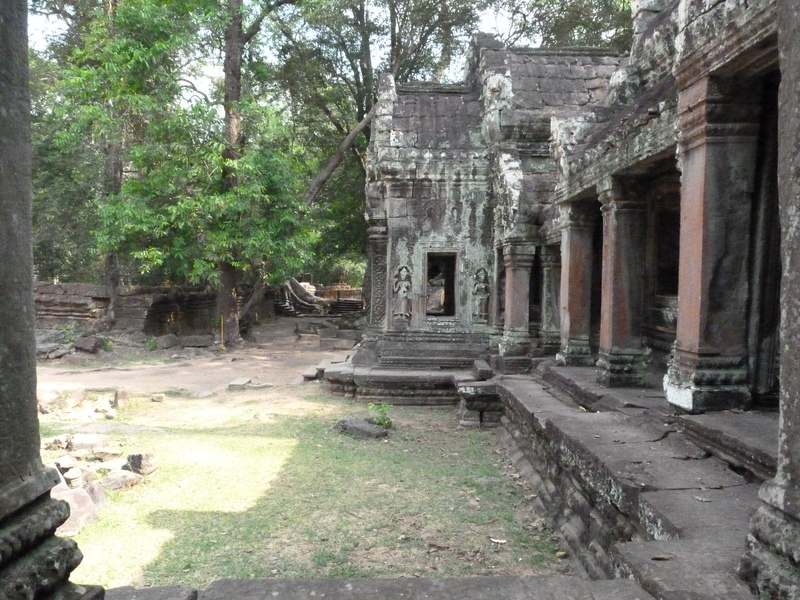 It is quite different to some of others because it is surrounded by jungle. 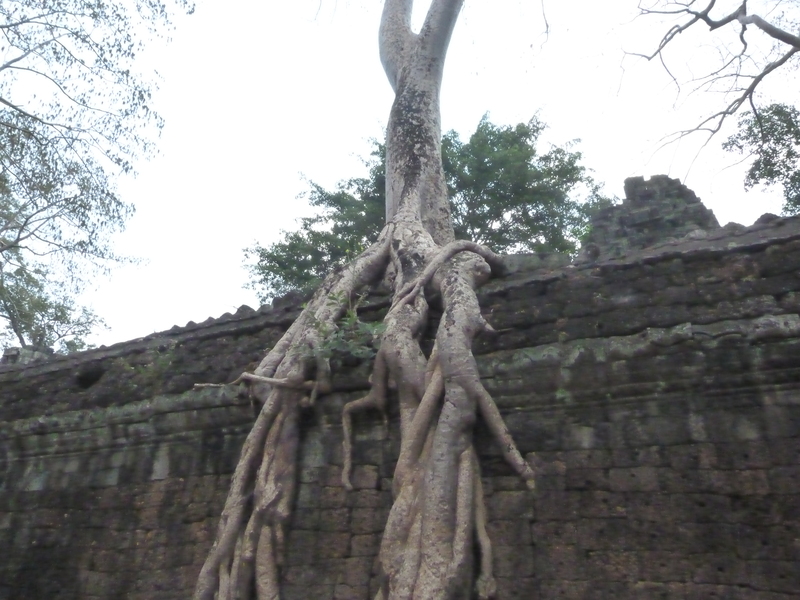 There are lots of huge trees with sprawling roots within the temple. 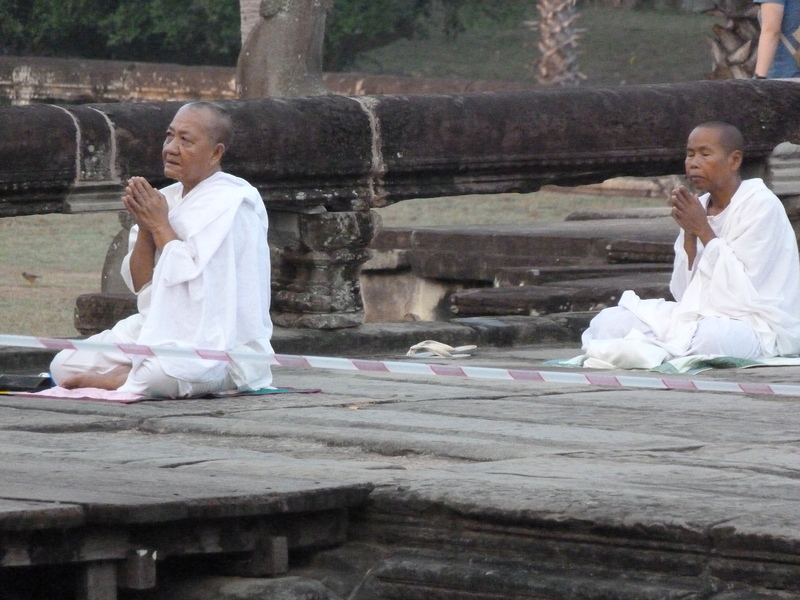 A day walking round the temples is HOT and it is important that women have their knees and shoulders covered. I looked like a complete loon but I wore a sports top with wicking material and baggy patterned trousers. I may have looked a bit silly but I was so much more comfortable. Also, don’t wear flipflops. 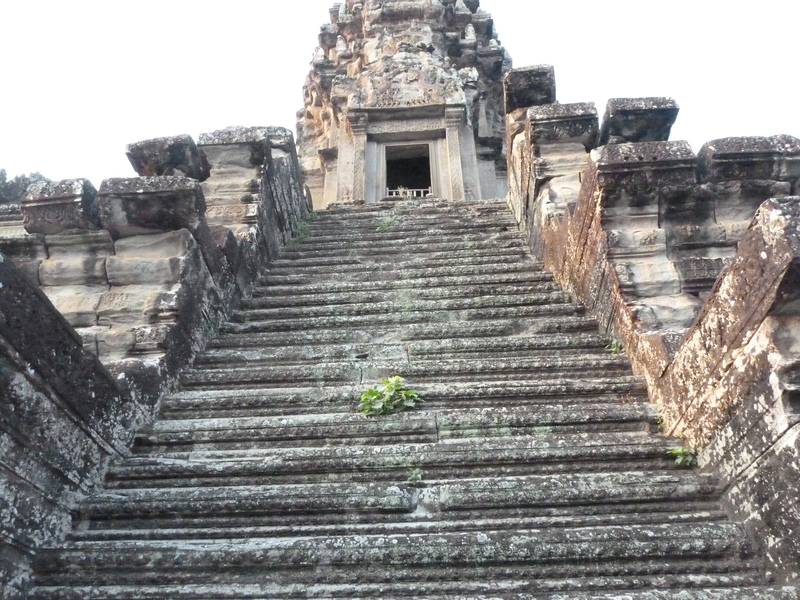 There are lot of really steep steps and I saw a lot of people in flipflops really struggling! Nothing can really prepare you for the masses of young children trying to sell you things. They tend to go round in little groups and approach tourists with baskets of things to sell such as postcards, bracelets and fans. It was really heart breaking hearing the desperation in their voices as they called “1 dollar, please Sir’. Some of them would even get hold of your arm. Buying anything from them is really discouraged as it encourages them to keep begging and keep out of school. 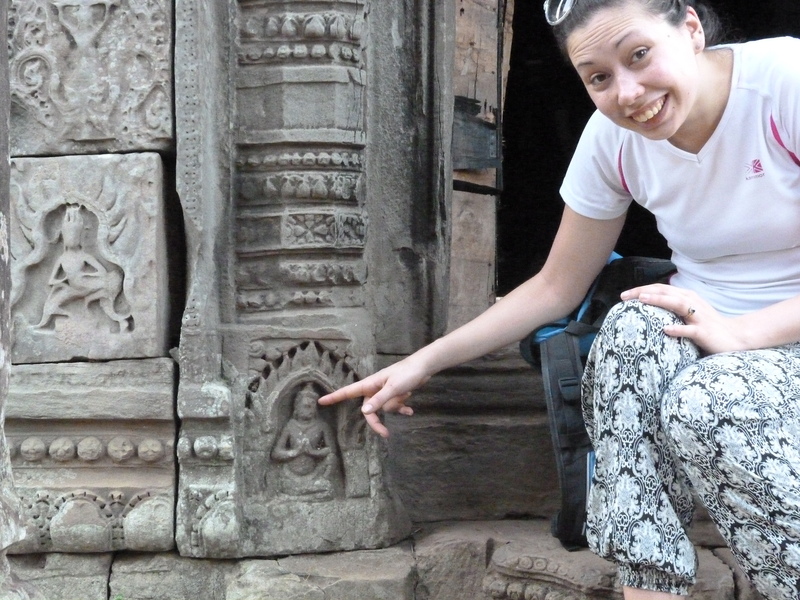 Previous Post 5 fun things to do in Siem Reap after the temples!